Chicken seasoned with TSTE® Greek Seasoning brings traditional Greek flavors to this dish! Create your own quick and delicious tzatziki sauce with TSTE® Vik's Garlic Fix! Spice Blend to accompany the gyros. Greece is one of the oldest civilizations in the world, located on the Mediterranean ocean at the base of the Balkan Peninsula. Greece is well-known for its light and flavorful dishes- some which have been served for thousands of years. Fruit and vegetables play a large part in the Greek diet and culinary trends vary from the inland regions of Greece to the coastline where residents prefer lighter, seafood dishes to heavier meat. Our Greek Chicken Gyros and Tzatziki Sauce recipe blends light herbal flavors with traditional yogurt-based tzatziki sauce and fresh vegetables. MAKE marinade. Mix 2 TBS lemon juice, red wine vinegar, 1/4 cup Greek yogurt, 2 TBS TSTE® Organic Extra Virgin Olive Oil, and TSTE® Greek Seasoning in a small bowl. ADD chicken breasts to a gallon-sized zip-top bag. Pound them until they are of uniform thickness-this will also tenderize them and allow them to cook faster. POUR the marinade into the bag with chicken and make sure it is evenly distributed. Marinate in the refridgerator for 1-3 hrs. GRILL marinated chicken over medium heat until fully cooked, or bake at 350°F for 25 mins (or until internal temperature reads 165F). Slice when cool. WHILE chicken is cooking, make the tzatziki sauce. Mix cucumbers and TSTE® Himalayan Fine Mineral Salt in a small bowl and allow to sit for 20 mins. Meanwhile in a medium bowl, mix remaining Greek yogurt, white wine vinegar, remaining (2 TBS) lemon juice, remaining TSTE® Organic Extra Virgin Olive Oil, TSTE® Dill Weed, and TSTE® Vik's Garlic Fix! Spice Blend. Drain water from the cucumbers and add to the Greek yogurt mixture. Mix. 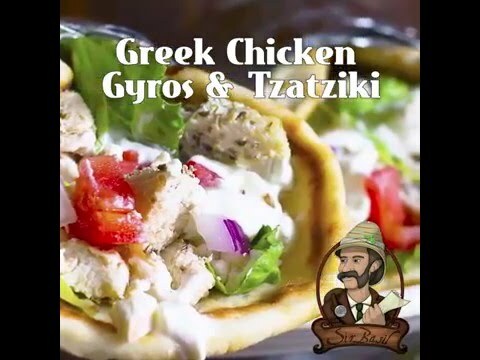 ASSEMBLE the gyros as follows: pita bread, chicken, lettuce, tomatoes, feta cheese, and topped with tzatziki.